Edward Snowden is the talk of the town among Hong Kong journalists, but not for the reasons he had in mind. Across East Asia lie dozens of haunts favored by spooks, spivs and journalists – drinking holes known for their discreet bartenders and shady customers who like to trade information. At the height of the Cold War the Continental Hotel in Saigon was perhaps the best known. Others, like the Crown Royal in Bangkok are still a venue for the shadowy world of secrets and intrigue while in Hong Kong the Foreign Correspondents Club (FCC) has long been associated with Chinese–Western brinkmanship. It was in the club’s backyard, as the FCC marked its 70th anniversary, that the man many say is responsible for the greatest intelligence leak in U.S. history arrived with as much fanfare as the newspapers in London and Hong Kong could muster. Edward Snowden, former CIA staffer, came with a bundle of documents from a secret location in the Chinese enclave. He was seeking sanctuary from a government he allegedly spied on. Richard Hughes, Ian Fleming and John La Carre – authors with strong ties to the FCC – would have been proud. The Guardian scooped the world with its revelations about the 29-year-old ex-CIA technical assistant and former employee of National Security Agency (NSA) contractor Booz Allen Hamilton, where he worked for less than three months. The report released global shockwaves as it detailed how he chose to leak a number of highly classified documents. The leaked documents focus on the NSA’s collection of phone records and PRISM, a highly sophisticated computer network used to access the personal archives of millions who use social networking sites and email services offered by the likes of Google, Facebook and Apple. But at the FCC’s main bar in Hong Kong opinions were far from united. Some saw his arrival as a great news story, with an explosive punch ready to rock the world. Others saw Snowden as a tragic figure with little to offer except a Julian Assange complex worthy of puns involving The Falcon and the Snowman. The truth is probably closer to the latter. 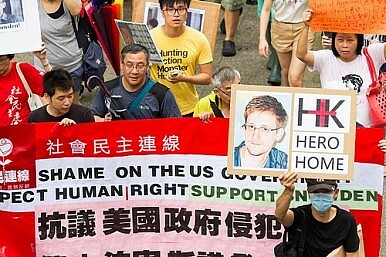 Civil society groups marched through Hong Kong over the weekend demanding the local government to grant Snowden asylum, while an international press corps flew into the city and established a beachhead at the FCC. But the actual fresh information Snowden made available is thin at best. Perhaps more importantly, he has caused a universal rethink on access to information and a readiness by the public to simply allow governments’ blind access to personal data which might be of little use to the intelligence community but in the wrong – or even just misguided – hands can devastate peoples’ lives. The great stories surrounding Snowden are still evolving. What will China do? Should he be extradited? Charged by the US with treason? What else is he hiding? Should the United Nations grant him refugee status? The potential list is endless, in particular the ramifications for Hong Kong. Like a good Bond movie or a La Carre novel the thrill lies not in the plot but in the journey and the romp along the way and this much Snowden has delivered – much to the pleasure of the patrons at the FCC and bars of similar ilk across the region. However, this is probably not what he had in mind when he began touting U.S. government secrets around the international press corps.